Joe Quinones' interweb-log: Poison. Poison Ivy. "Pheromone Dust, designed to heat a man's blood." 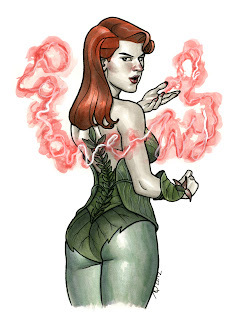 Poison Ivy. From Emerald City Comic Con, 2012. Copic markers, pen & ink on 9x12” bristol board. Nice Ivy! Love the backside view and the mist that spells her name.